Larkin Hoffman is committed to serving the communities in which we work. One of the most rewarding services we provide our community is legal services to those of limited means. We encourage all legal personnel to provide pro bono services and consider these services to be part of our practice. Larkin Hoffman was one of the first 14 firms to sign on to the voluntary Minnesota State Bar Association Pro Bono Standard. As a leader in our profession, we commit to providing 2% of the firm’s billable hours to assisting individuals and organizations dedicated to addressing the needs of persons with limited means. The firm’s attorneys are active members of chambers of commerce and city councils, and serve on the boards of local universities, hospitals and museums. Our employees have consistently participated in organizations such as The Salvation Army, Habitat for Humanity, the National MS Society, Bridging and the American Cancer Society. We do well by doing good, as this spirit of dedication and teamwork makes for a positive work environment and plays a vital role in successfully fulfilling the needs of thousands of clients. We are very proud of the community organizations we serve. On January 21, 2019, Larkin Hoffman proudly honored the life and legacy of Dr. Martin Luther King, Jr. in a day of service. This year Larkin Hoffman partnered with Bridging to build furniture for individuals transitioning out of homelessness. 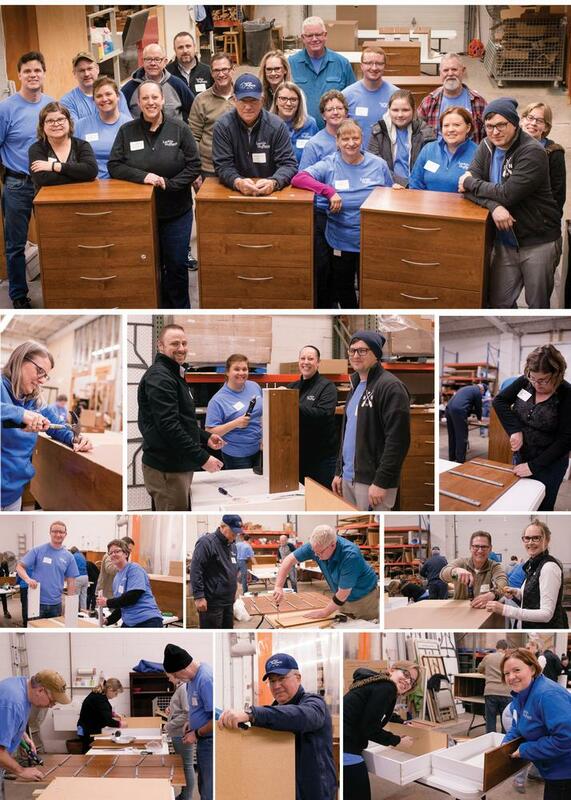 Firm employees and ‎their families assembled 27 new dressers for Bridging clients at Bridging’s warehouse in Bloomington, ‎Minnesota. Bridging, a nonprofit organization serving primarily the greater Twin Cities, provides donated furniture and household goods to families and individuals transitioning out of homelessness and poverty. Bridging is driven by volunteers and donations of basic home essential items from the community. Since 1987, Bridging has served more than 90,000 local Twin Cities households and reduces landfill space by 10 million pounds each year. Larkin Hoffman proudly partnered with Bridging for its fifth annual Martin Luther King Jr. Day of Service. On Monday, January 21, 2019, Larkin Hoffman proudly will continue its tradition of partnering with a nonprofit organization in a day of service to honor the life and legacy of Dr. Martin Luther King, Jr. This year we will partner with Bridging, a nonprofit that provides donated furniture and household items to individuals transitioning out of homelessness. Firm employees and ‎their families will build 27 new dressers for Bridging clients at Bridging’s warehouse in Bloomington, ‎Minnesota. Larkin Hoffman marched in Twin Cities Pride’s Ashley Rukes GLBT Pride Parade on June 24. More than fifty of the firm’s attorneys and staff members, as well as their family and friends, marched in support of Twin Cities Pride’s mission of commemorating a diverse heritage, fostering inclusion, and celebrating achievements in equality. 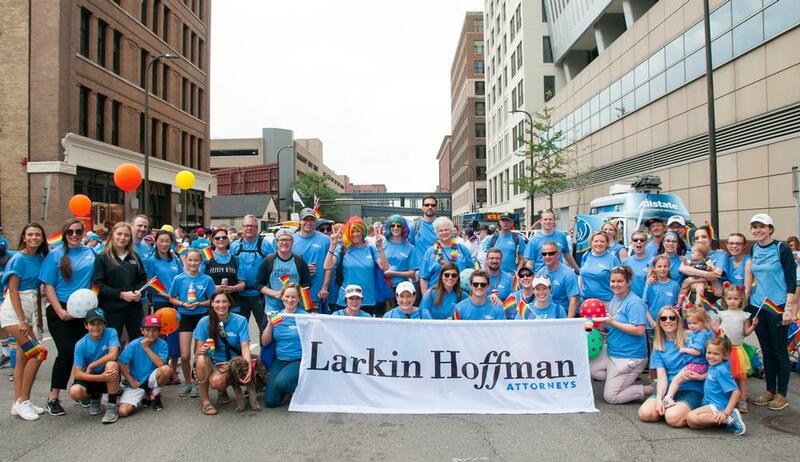 Larkin Hoffman joined 140 other groups, organizations, and business of all sizes in one of the largest GLBT events in the United States. 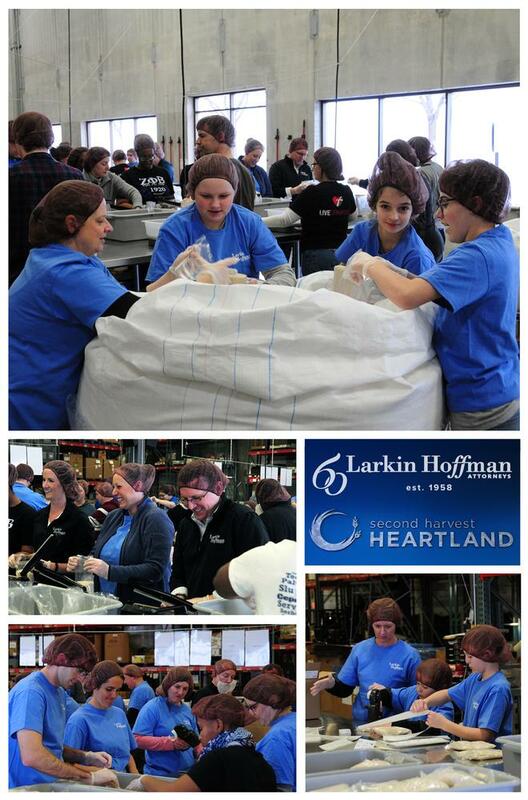 Employees of Larkin Hoffman, friends and ‎family members spent Jan. 15, 2018 sorting and packing food at Second Harvest Heartland to fight hunger in Minnesota and Wisconsin. Monday’s food packing effort marks the fourth consecutive year that the firm has partnered with Second Harvest on Martin Luther King Jr. Day for a day of service in memory of Dr. King. Over the course of the afternoon, 29 volunteers from the Larkin Hoffman packed 4,202 pounds of food to be distributed to food shelves in 59 counties in Minnesota and Wisconsin. The food shelves feed children, adults and seniors experiencing food insecurity. Second Harvest Heartland is one of the nation’s largest food banks delivering more than 80 million meals a year to nearly 1,000 food shelves, pantries and other programs in Minnesota and western Wisconsin. Second Harvest Heartland was founded on Oct. 1, 2001, when Second Harvest Greater Minneapolis and Second Harvest St. Paul merged after decades of separately fighting against hunger. Larkin Hoffman is pleased to announce that Dan Ballintine has been honored as the recipient of the firm’s Bob Hoffman Community Service Award for 2017. The firm presents the Bob Hoffman Community Service Award annually to an employee who best demonstrates an exemplary commitment to community service. Dan has been Bridging’s secretary for several of his years with the organization and is the chair of its personnel committee, where he uses his skills and experience at a labor and employment law specialist to provide free consultation with Bridging’s executive director and staff on personnel-related issues. He has also been an avid supporter of Bridging’s fundraising activities. Dan, along with Larkin Hoffman, has sponsored the organization’s well-known “Subway Bedrace for Bridging” at Buck Hill in Burnsville, as well as its annual gala. Dan is a litigator who represents companies in employment-related claims. He has developed a specialty for handling cases that involve temporary restraining orders. 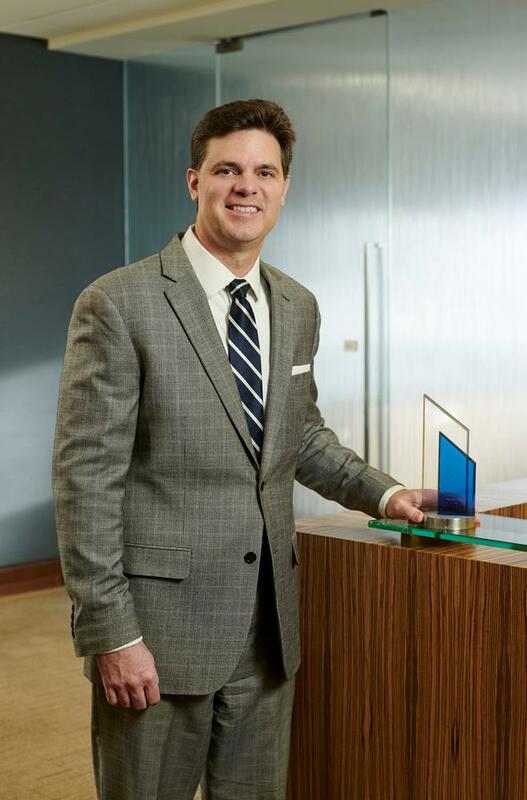 Dan also acts as general counsel for clients across a broad range of industries and represents all types of businesses including senior care conglomerates, manufacturing companies, retail establishments and service firms. Each year, Larkin Hoffman employees nominate co-workers they identify as someone who most exemplifies the spirit of service to the community that was established as a guiding principle for the firm by founder Bob Hoffman. Throughout his career, Bob earned a reputation as a great real estate and land use attorney as well as a man who generously gave back to his community. It is in honor of Bob that the firm established this award. Last weekend, Larkin Hoffman employees helped The Salvation Army kick off its 2017 bell-ringing season at the Mall of America. Nearly 20 volunteers from the firm took collections at three red kettles located at MOA entrances for 15 hours on Saturday, Nov. 18. The firm also provided direct financial support to The Salvation Army. The Salvation Army’s bell-ringing season will run through the evening of Dec. 24. One shift of bell ringing can raise enough money to provide two bags of groceries or a night of shelter for men, women, and children who use The Salvation Army’s services. Learn more about The Salvation Army and its volunteers.